Krakow blog for visitors and residents. Click here to write your contribution to our Krakow blog. Authors of the entries to the Krakow Forum take full responsibility for their content. The following does not necessarily represent opinions of the Krakow Info editors. 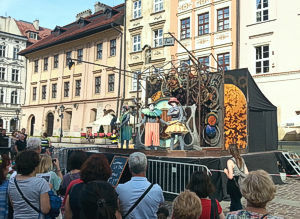 Summer opera festival in Krakow. /2019-04-12/ In 2019 Krakow Opera Summer Festival starts June 7th to end June 29th. Three events take place in the courtyard of the Wawel Royal Castle - namely two concerts of arias and a concert featuring operatic choral music. On June 19th concert Dialogue Between Masters: Mahler and Strauss is to take place at the Polish Aviation Museum at 39 Jana Pawla II avenue Otherwise the venue is the Opera House at Lubicz street. Free concerts of classical piano music for four hands. /2019-04-10/ 3rd Duettissimo! International Piano Duo Festival in Krakow takes place from April 23rd through April 29th, 2019 in the Akademia Muzyczna conservatory at 43 sw. Tomasza street. Two daily concerts - one at 4 pm and another at 7 pm - feature pianists playing piano duets and other classical music for four hands. The concerts are free of charge. April jazz festival in Krakow. /2019-04-06/ The 25th edition of the Old and Young Krakow Jazz Festival takes place this month. Concerts of international stars take place on April 16th - John McLaughlin with his band, The 4th Dimension - and April 27th when Kandace Springs sings in the Manggha Museum. The festival program also includes three concerts of Poland's outstanding jazzmen on April 28th, April 29th, and April 30th. 2019 Beethoven Easter Festival's events in Krakow. /2019-03-29/ In 2004 the Ludwig van Beethoven Easter Festival has been moved from Krakow to Warsaw, where most of its concerts take place. Still, some events are organized in Krakow. And this year the Krakow part of the Beethoven Easter Festival consists of three concerts in in the Krakow National Museum’s Galeria Sztuki Polskiej XIX Wieku gallery in the Cloth Hall, 1-3 Rynek Glowny central square, April 1-3 plus one in in Filharmonia Krakowska concert hall, 1 Zwierzyniecka street and Straszewskiego stree on April 12, 2019 and a noon recital at the Jagiellonian Library, 3 Oleandry street on April 1st. /2019-03-22/ The 24th Krakow festival of Bach music, called Bach Days, goes from Sunday, March 24th through Sunday, March 31st with one concert of the best Baroque music every day in Aula Florianka, 15 Sereno Fenna street. at 7 pm. All concerts are free of charge. Cello music for free in March. /2019-03-15/ The local festival of music for violoncello, called the 6. Krakow Cello Spring, starts Wednesday, March 20th to last through Saturday, March 23rd, 2019. 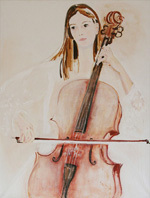 The cello festival consists of four concerts, one each day, all scheduled for 7 pm. Admission to every concert is free of charge. Venue - Aula Florianka at 15 Sereno Fenna street. Henry Moore sculptures in Krakow: no tickets, some walk. /2019-03-05/ The National Museum in Krakow shows Henry Moore’s sculptures at its four branches till June 30th, 2019. The exhibition called “The Power of Nature. Henry Moore in Poland” features his monumental works in the open air as well as smaller ones indoors. They are exhibited in the museum’s Main Building (Gmach Glowny) at 1, 3 Maja street and also at Europeum (Plac Sikorskiego square), the Szolayski House (Plac Szczepanski square), and The Czapski Museum at 12 Pilsudskiego street. Henry Moore is habitually referred to as “arguably the greatest sculptor of the 20th century” and you may see his works free of charge in Krakow, yet the scattered exhibition requires a fair amount of walking (though it’s good for your health, they say). Easter market starts in Krakow April 11th. 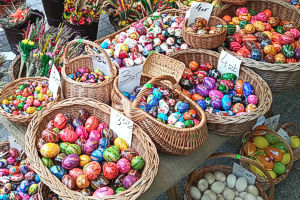 /2019-02-26/ In 2019 the Easter market in Krakow starts in the Rynek Glowny central square on Thursday, April 11th and it'll continue through Monday, April 22nd. Visitors will be able to choose a wide range of the Polish traditional Easter decorations. Also, varied foods and village handicrafts will be on sale. 2019 Krakow Easter festival of music. /2019-02-18/ This year the Misteria Paschalia Krakow Easter festival of classical music takes place throughout Holy Week starting on Monday, April 15th to continue through Monday, April 22nd 2019. The festival features some of Europe's top early music ensembles and soloists. In 2019 the festival features Italy's Baroque church music. Street theatre fest July 4-7. /2019-02-14/ The 32nd ULICA International Street Theatre Festival in Krakow takes place July 4th through July 7th, 2019 with simultaneous alfresco performances in the Rynek Glowny central square as well as other public spaces but always free of charge. This year's edition of the festival has the phrase "Oh, what a circus!" as its theme. Latest World Press Photo on show in Krakow. /2019-02-11/ Exhibition „World Press Photo 2018” takes place in Nowohuckie Centrum Kultury culture centre at 232 al. Jana Pawla II from February 8th through February 28th, 2019. The show features 137 blow-ups selected from 70,000 pictures entered for the 61st edition of the venerable photojournalism contest last year. Some images on display are nasty and organizers discourage minors from visiting the exhibition. A regular admission fee is 10 zlotys (PLN). 2019 stellar performers at the Krakow Arena. /2019-01-15/ The world's star performers coming to Krakow in 2019. Ennio Morricone January 19, ZAZ February 23, Dire Straits February 24, Shawn Mendes April 2, Elton John May 4, Enrique Iglesias May 7, Jamiroquai May 23, Andre Rieu May 30, Maroon 5 June 6, KISS June 18, Rod Stewart June 21, Muse June 22, Diana Krall June 28, Mark Knopfler July 10, Ariana Grande September 9, Michael Buble September 20. Venue Tauron Arena Krakow at Lema street. New Year's market till January 6th. /2019-01-03/ New Year's market to goes on in Rynek Glowny central square through Sunday, January 6th, 2019, the Epiphany Feast. Copyright © 2017, 2018 by MAREK STRZALA. All rights reserved.